There’s something to be said for understated class. Anyone can dazzle with glitz and pomp. And anyone can carry a sword with no dazzle at all. But it’s the quietly shining weapons that best combine the lethal ruggedness of a killer with the refined grace of gentry. 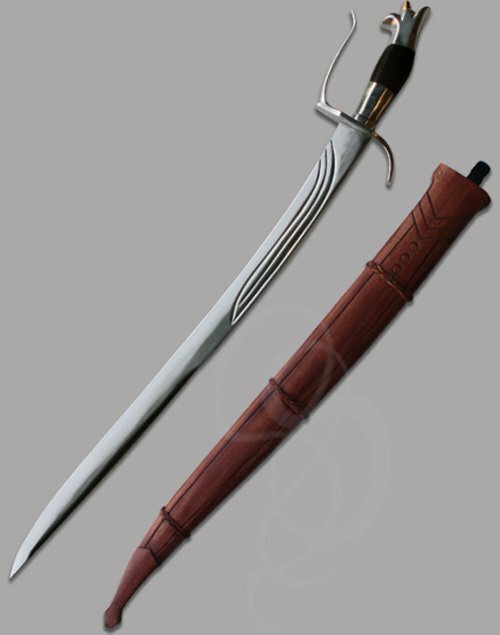 The Dundarei saber is a fully-tempered and battle ready sword, and anyone looking at it will know that you might be lethal, but you are no brawler or common thug. The swept forward blade allows for powerful strokes. And the graceful fullers carved on the forte of the blade makes you look good while making those strokes. The grip is split into thirds of steel and finely polished black wood, with a sculpted pommel at the top. The lower guard is somewhere between a long arming-sword flange and a saber’s knuckle-bow. The upper guard is short and spiked outward to trap enemy blades. In all, the sword has a the graceful body of a dancer, with the combative power of a mercenary. And you can’t just put that kind of awesome into a normal sheath. The Dundarei Saber comes with a lavishly carved and beautifully stained wooden sheath. This is no decorative sword. This is a fully functional sword, used by martial artists for cutting and training. It comes sharp and ready for understated, classy use. Blade Width at Widest Point: 1.25 in. Sword Weight Without Scabbard: 1.6 lbs.